The Blazers lost 14 key seniors due to graduation last season. This year, it will be practically newcomers. The men’s basketball team had its best season in recent memory. 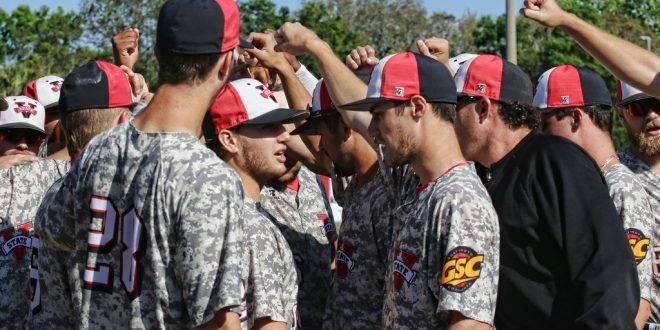 The team finished their season with a record of 26-5 and had the best record in the Gulf South Conference, claiming the regular season conference crown. The Blazers also finished third in scoring offense in the country with 92.8 points per game, while the defense allowed 82 points a game. Against conference opponents the 18-2, and their two loses were against the University of West Florida. VSU Blazers was in the top tier of the GSC stats. In all statistical categories, the team was in the top five. Junior Beau Justice had a stellar year, collecting numerous honors, such as the GSC Player of the Year, First-Team All-GSC, and National Association of Basketball Coaches All-American. Senior KJ James was named Second-Team All-GSC. Junior Winston Morgan became the first player in VSU history to reach the century mark in three-pointers made in a season (106). The team went on an 18-game win streak, best in school history for men’s basketball. The season ended with a first round exit in the NCAA Division II tournament against Eckerd College at Morehouse College in Atlanta. The VSU women’s basketball team also had a successful season under Head Coach Carly Kuhns, though they didn’t reach the heights achieved the previous season. This year, the team finished the season 23-9 and was placed third with a 15-5 conference record. The Blazers did a fine job this season and finished in the top 10 of Division II South standings. The team was knocked out in the quarterfinal round of the GSC tournament by the University West Florida. They were later invited to play in the South Region NCAA Division II tournament. The team won the first two games but was eliminated by Union University. Madi Mitchell, a senior from Warwick, Georgia, had a tremendous season and earned her second All-American Honorable Mention award from the Women’s Basketball Coaches Association. Mitchell finish the season averaging 18.3 points and 8.9 rebounds per game. Another player that did well during the 2017-2018 season was Kenya Samone’ Dixon. She was second in rebounds with 291 boards in the Gulf South Conference. The softball team has had an extraordinary season, one that no one saw coming. The squad currently holds a 38-9 record, which ranks second in the GSC standings, trailing North Alabama. The Blazers are also 22-7 against conference opponents. Senior Taylor Hartenbach ranks fifth in the GSC in home runs with nine and sixth in RBI’s with 34. Home runs are a normality for the Blazers, as they rank third in the GSC with 39. Fans have seen lots of balls slapped over the fences. The squad ranks seventh in field percentage with .954 in the GSC. Head Coach Thomas Macera notched his 800th career win as a head coach at the collegiate level. The men’s and women’s tennis team have completed their season and both are on other ends of the spectrum. During the season, the Blazers coasted past most of their opponents. The men’s tennis team finished second in the GSC rankings and are 10-1 in conference play. In Division two rankings VSU is ranked twelfth nationally. VSU’s women’s tennis team, on the other hand, finished the season with a 6-14 record on the season. The team was expected to do big things this year after three of the top VSU’s tennis players graduated last year, opening space for the younger players. Poncelet is a graduate student at VSU and is from Landen, Belgium. The women’s team ranked seventh in GSC rankings, owning a 6-6 record against conference opponents. The women’s team suffered a first round loss in the GSC Tournament to Montevallo. The score was 1-5. The Blazers baseball team is 43 games into the season and is desperate for healthy players to get back on the field. Until the five of the six players can play, the baseball team will fight as hard as they can to get some wins. At the beginning of the year, the offense was struggling and the pitching was sometimes carrying the team, until they met Delta State University. The Blazer were near victory in two of the three games but when a team loses players to injury against the one of the top teams in Division II baseball, it can be tough to compete. The Blazers have a record of 18-25 and are in the lower tier of the Gulf South Conference standings with a 10-16 conference record. At the plate, hitting has been a weakness for the Blazers. Their current batting average of .257 percent ranks them eleventh in the GSC. Also, they have 25 home runs on the season, which ranks seventh in the GSC. VSU’s pitching staff is trying to stay afloat. They are in the top tier with strikeouts and have given up only 18 home runs. The Blazers fielding percentage is also in the dumps. They are in second-to-last place with a .946 percentage. The team also has the most errors in the GSC. Written by Prince Robinson Jr., Asst. Sports Editor. Photo courtesy of VSU Athletics.